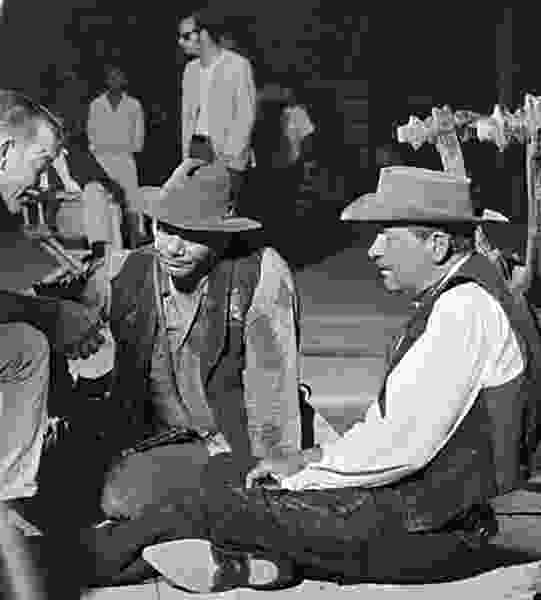 (Bernie Abramson | Courtesy of Jeff Slater / Bloomsbury Publishing) Director Sam Peckinpah, left, discusses a scene with Ernest Borgnine, center, and William Holden on the set of "The Wild Bunch." Stratton saw “The Wild Bunch” when it came out 50 years ago, when he was a 13-year-old kid at his local theater in Guthrie, Okla. It changed his life. Stratton — who has written books about college football, boxing and rodeo — dives into the making of this 1969 classic in a new book, “The Wild Bunch: Sam Peckinpah, a Revolution in Hollywood, and the Making of a Legendary Film” (Bloomsbury Publishing; 352 pages, hardcover; $28). Stratton will talk about the movie and his book at two free screenings in Utah this week: Tuesday, 7 p.m., at the City Library, 210 E. 400 South, Salt Lake City; and Wednesday, 6:30 p.m. (with a discussion starting at 5:30 p.m.), at Star Hall, 159 E. Center St., Moab. The screenings are co-presented by Utah Humanities and the Utah Film Center. The movie, set in Texas and Mexico in 1913, tells of a gang of outlaws — played by tough-guy actors William Holden, Ernest Borgnine, Ben Johnson and Warren Oates — trying to make one last score before retiring. The heist becomes an ambush, and the gang flees across the Rio Grande, only to get caught up in the Mexican Revolution. The book digs into how timing and lucky coincidences brought the cast and crew together in Mexico to make the movie happen. It all starts, Stratton said, with Peckinpah, “a kind of visual poet” who was on the outs in Hollywood at the time after the failure of “Major Dundee,” a 1965 frontier epic starring Charlton Heston. Stratton was fascinated with Peckinpah. “I started reading whatever books I could find about him,” he said, noting that he found 36 books on Peckinpah by the time he started writing his book. 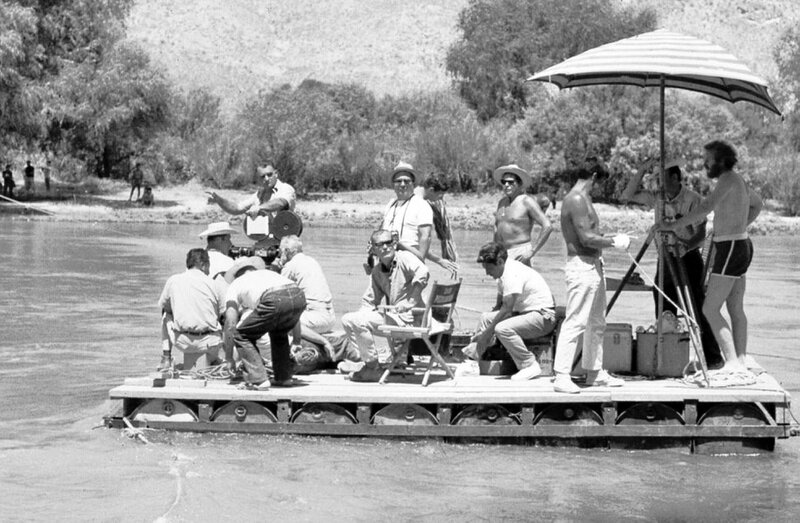 (Paul Harper | courtesy of Nick Redman and Jeff Slater / Bloomsbury Publishing) Director Sam Peckinpah, center, and crew on a barge on the Río Nazas during shooting of the 1969 Western "The Wild Bunch." Among the most interesting things, Stratton said, were the contributions of Latino filmmakers in the cast and the crew. “I discovered that every Mexican character was portrayed by a Latino actor, most of them from Mexico,” Stratton said, noting that Jaime Sánchez, who played the youngest gang member, Angel, was from Puerto Rico. Casting Latinos to play Latinos was unusual in 1960s Hollywood. In “The Professionals” (1966), the Mexican bandit who was the movie’s villain was played by Jack Palance, who was born in Pennsylvania of Ukrainian parents. And the Russian-born Yul Brynner famously portrayed the Mexican revolutionary Pancho Villa in 1968’s “Villa Rides” (for which Peckinpah is one of the three credited screenwriters). Most of the movie was shot in Parras, the home town of Francisco Madero, the first president installed during the revolution. Peckinpah cast Madero’s kid brother, Raul, as an extra. And the locomotive used in the film, National de Mexico No. 650, was in service during the revolution. Stratton cites the story of stuntwoman, actor and singer Yolanda Ponce, who got her first acting credit in the film. In the first scene shot in the production, Ponce stunt-doubled for an actress whose character was trampled to death by a horse. At the end of the stunt, another stuntman accidentally backed a horse onto her, and the horse stepped on her abdomen, fracturing her pelvis. Three weeks later, still nursing a sore belly, she came back to work, filming a scene where she shot Holden’s character with a shotgun — with a rope tied around her waist, yanked by two crew members to simulate the gun’s recoil. 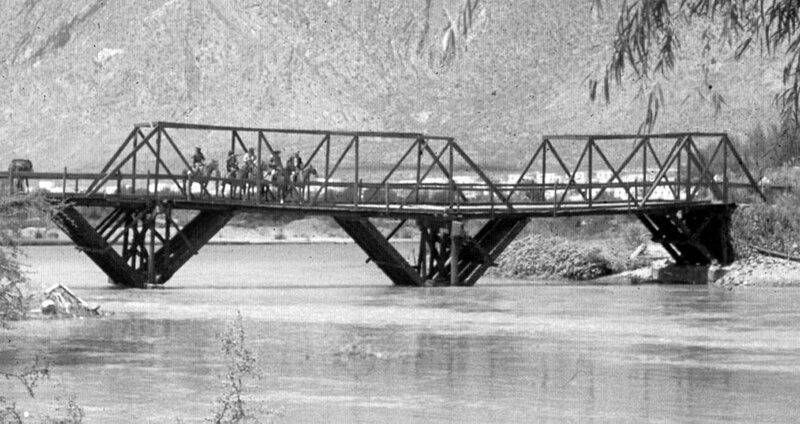 (Paul Harper | courtesy of Nick Redman and Jeff Slater / Bloomsbury Publishing) Actor Paul Harper captured images of a bridge before it was demolished with explosives for a scene in Sam Peckinpah's 1969 Western "The Wild Bunch." Though “The Wild Bunch” is seen as a one-of-a-kind movie, a monolith unto itself, its existence was based on other movies of its era. Meanwhile, George Roy Hill’s “Butch Cassidy & The Sundance Kid” (1969) set a Hollywood record for the amount of money — $400,000 — screenwriter William Goldman was paid for the script. It and the Leone films “really stirred things up in Hollywood, in terms of how much money could be made with Westerns,” Stratton said. Arthur Penn’s gangster romance “Bonnie & Clyde” (1967) introduced a new level of gun violence to movies — and showed Peckinpah how to employ “squibs,” packets of fake blood attached to small explosives, to simulate bullets hitting bodies. Peckinpah saw “Bonnie & Clyde” and wanted to “take it to the next level,” Stratton said. But Peckinpah didn’t want the glamorized, almost sexual death scene that Penn shot of Warren Beatty and Faye Dunaway. “Peckinpah had none of that. He made death anguished and dirty and painful,” Stratton said. Toward the end of his book, Stratton quotes British film scholar Jim Kitses, who wrote that “‘The Wild Bunch’ is America.” Stratton agrees. Salt Lake City: Tuesday, 7 p.m., City Library auditorium, 210 E. 400 South, Salt Lake City. Moab: Wednesday, discussion starts at 5:30 p.m., screening starts at 6:30 p.m., Star Hall, 159 E. Center St., Moab. Presenters: Utah Humanities and Utah Film Center. Editor’s note: Reporter Sean P. Means’ wife is an employee of the Utah Film Center. Correction: An earlier version listed an incorrect start time for the Moab screening.